Digital audio converters (DACs) come in all sizes, shapes, and prices. You can find simple digital converters on Amazon for as little as $7 or state-of-the-art units that cost as much as a comfortable middle-class home. To say that today’s audiophiles have choices is an understatement. But what price point offers the highest value or greatest bang for the buck? For some audiophiles, one of the best options in the past was to buy the most expensive DAC they could afford and then use it until it became completely obsolete. This “buy and hold” strategy is exactly what I have employed with top-shelf analog gear—my 20-plus-year-old Pass X150.3 power amplifier still performs at a competitive level compared with new designs. But when it comes to DACs, advancements have been rapid and the list of “must-have” features has grown and changed. I know of no twenty-five-year-old consumer DACs that can deal with 192/24 high-resolution files, or DSD files, or that can offer Bluetooth connectivity capabilities. Sure, some still sound wonderful with 44.1/16 Red Book files, but digital technology has moved on. When it comes to DACs I believe the best price/performance ratios are delivered by “affordable” ones such as the unit up for review, the iFi Audio xDSD. Indeed iFi was founded on the idea that high-performance digital products can be reasonably priced. Its most expensive, recently introduced “flagship,” the iFi Pro iDSD, is only $2499, but includes a “quad stack” of Burr-Brown DAC chips and a selectively engageable General Electric 5670 tube in the signal path! The iFi xDSD may not have quite that many DAC chips and has no tubes, but it does have a remarkably rich feature set and the ability to serve as both a desktop or portable unit. You could use the xDSD DAC with your computer, smartphone, CD transport, streamer, or even as a digital source-selector and decoder for a room-based stereo system. And, yes, it supports MQA. Its MSRP is a princely $399. The xDSD is small and enclosed in an aluminum/magnesium chassis. The entire xDSD measures approximately 2¾" by 7/8" by 3¾" and weighs 127 grams (0.28 lbs.). The DAC supports resolutions up to 768/24 PCM and DSD512 via its Burr-Brown DSD1793 DAC chip. The xDSD offers some user-selectable digital processing in the form of two PCM filters: “listen” and “measure.” As you might suspect, iFi recommends the “listen” setting over the “measure” setting, even though the “measure” setting offers slightly better specs. The xDSD uses an analog rather than a digital volume control. With 101 discrete steps, iFi calls this newly designed output system the “Cyberdrive.” According to iFi, “the OV4627 ultra-low-noise FET input op-amp and W990VST digitally controlled stepped attenuator deliver a new level of sound quality.” The stepped volume control, 3D+ Matrix, and X-Bass can be completely bypassed when a user selects the line-output mode, which is recommended when using the xDSD connected to an analog preamplifier. 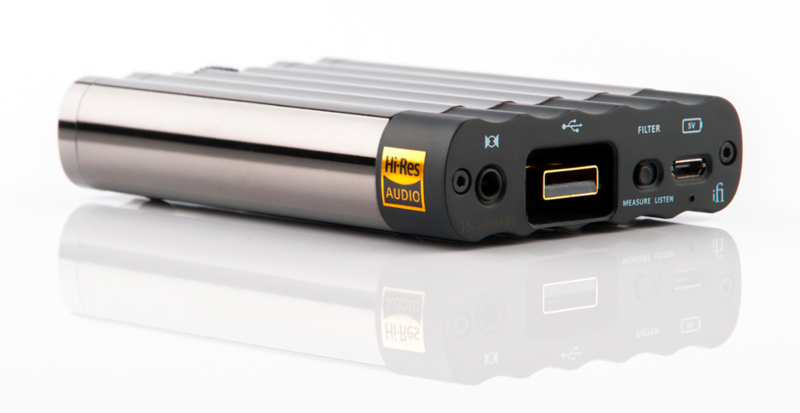 Unlike many portable DACs, which rely on a smartphone’s connection for power, the iFi xDSD has a built-in battery, so it won’t be running down your smartphone or portable source device’s power as rapidly when you’re listening. The internal lithium-polymer battery produces 2200mAh which, according to iFi, allows between six and eight hours of playing time (depending on the sample and bit rate of the music files and the efficiency of your attached earphones). When you’re not jaunting about town, the xDSD can be powered via its micro USB charge port. The port can get power from virtually any standard USB 2.0 or 3.0 connection. You can connect it to one of your computer’s USB outputs or use a separate free-standing USB wall-wart. Also, iFi makes a USB power device called the iUSB 3.0 ($429), which can be placed between a computer’s USB output and the xDSD’s micro-USB power input as well as its primary USB source input.